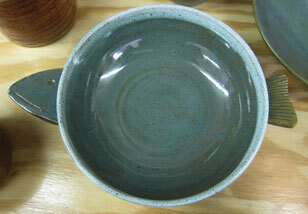 The latest firing, the first of two, produced some interesting results. I’ll have a complete set of photos on Flickr in the next week or so, but the highlights were the fish bowls, in crystal blue-green, and the indigo float plates. They came out really nicely. There were some dinner bowls that were glazed in crystal blue-green that came out very nicely, but not quite as blue as I’d hoped. Overall, I’m pleased with this firing. 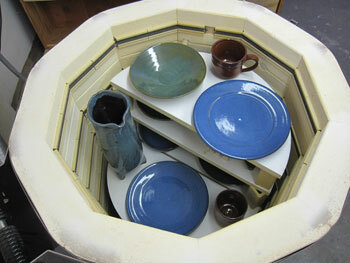 The rest of the last glaze cycle will go in this evening and should be out this weekend. More photos coming soon.